“OMG, You hafta see this. Look what I did,” I stop friends and strangers. “Look. I’m so proud,” I say, carefully unwrapping the small bundle that’s always in my arms these days, and shoving it at them. This must be terrifying to people. This is not really like me. It’s a little embarrassing, actually. And it feels a lot like I’m in love. After my daughter died, five years ago, it took me six months to discover the healing powers of writing. Over a year passed before I found myself completely captivated by Photoshopping. And now, I have put these two life-saving pastimes together and birthed a tiny new book. Stories with pictures are like comfort food. NeverGone: Reframing the Death and Grieving of the One You Love, with its twelve short illustrated stories (many from my recent blogs), is about regaining life and redefining it. It examines different ways to look at death. I wanted to make a book that would hug the heartbroken. Thinking of all my friends who are grieving for loved ones, I tried to plant hope on each page. I’d always said I would never self-publish anything. And my 200-page memoir manuscript may end up being like one of those grown children who never leave home. But to see one’s work transformed into a freshly bound, polished package is to feel your blood turn into maple syrup. It is just a little book (28 pages, half the size of a piece of copy paper). But writing it, and producing the illustrations, opened a window to the sun from the dark basement of my grief. I poured all my time, energy, and love into it. As if it were another daughter. Do you know someone who is grieving? Are you grieving? 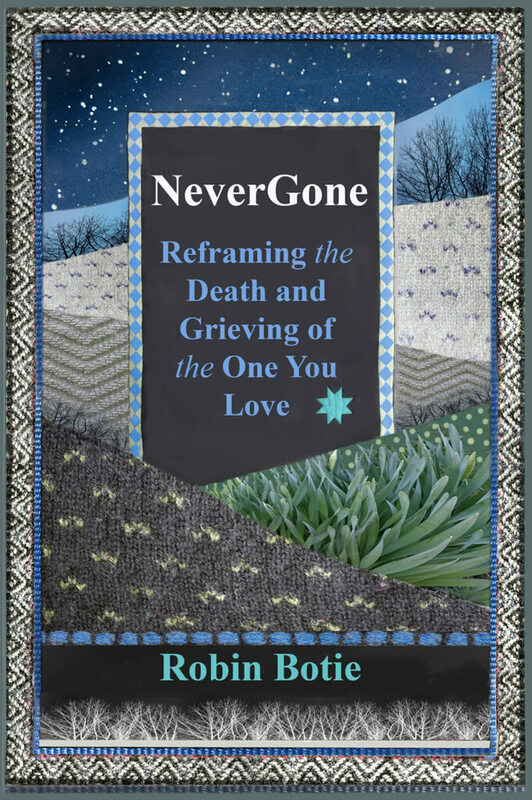 NeverGone: Reframing the Death and Grieving of the One You Love is available for sale at Magcloud.com. This entry was posted in 2016 and tagged a book of hope, A Little Book of Hope, are you grieving, book of inspirational stories, comfort for the grieving, healing power of writing, I published a new book, nevergone on 2016/05/02 by Robin Botie.